Jack Palance (/ˈpæləns/ PAL-əns; born Volodymyr Palahniuk (Ukrainian: Володимир Палагню́к); February 18, 1919 – November 10, 2006) was an American actor and singer of Ukrainian origin. He was nominated for three Academy Awards, all for Best Actor in a Supporting Role, receiving nominations for his roles in Sudden Fear (1952) and Shane (1953), and winning the Oscar almost 40 years later for his role in City Slickers (1991). 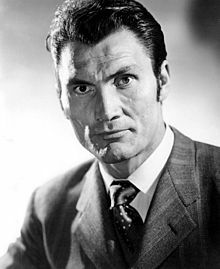 Jack Palance was born Volodymyr Palahniuk in Lattimer Mines, Pennsylvania, the son of Anna (née Gramiak) and Ivan Palahniuk, an anthracite coal miner. His parents were Ukrainian immigrants, his father a native of Ivane Zolote in southwestern Ukraine (modern Ternopil Oblast) and his mother from the Lviv Oblast, an ethnic Pole. One of six children, he worked in coal mines during his youth before becoming a professional boxer in the late 1930s. Fighting under the name Jack Brazzo, Palance reportedly compiled a record of 15 consecutive victories with 12 knockouts before losing a close decision to future heavyweight contender Joe Baksi in a Pier-6 brawl (a colloquial term meaning an unsanctioned and particularly rough fight). Years later he recounted: "Then, I thought, you must be nuts to get your head beat in for $200." With the outbreak of World War II, Palance's athletic career ended, and his military career as a member of the United States Army Air Forces began. Palance's face, which took many beatings in the boxing ring, was said to have become disfigured while bailing out of a burning B-24 Liberator bomber during a training flight over Southern Arizona (where Palance was a student pilot). His distinctive cheekbones and deep set eyes were said to have been the result of reconstructive surgery. The story behind Palance's face was repeated numerous times (including in respected film reference works), but upon his death, several obituaries of Palance quoted him as saying that the entire story had been contrived: "Studio press agents make up anything they want to, and reporters go along with it. One flack created the legend that I had been blown up in an air crash during the war, and my face had to be put back together by way of plastic surgery. If it is a 'bionic face', why didn't they do a better job of it?" Palance was honorably discharged from the United States Army Air Forces in 1944. After the war, he attended Stanford University, leaving one credit shy of graduating to pursue a career in the theatre. During his university years, he worked as a short order cook, waiter, soda jerk, lifeguard at Jones Beach State Park, and photographer's model. His last name was actually a derivative of his original name. In an episode of What's My Line?, he described how no one could pronounce his last name and it was suggested that he be called Palanski. From that he decided just to use Palance instead. Palance made his Broadway debut in The Big Two in 1947, playing a Russian soldier, directed by Robert Montgomery. Palance appeared in two plays in 1948 which had short runs, A Temporary Island and The Vigil. He debuted on television in 1949. Palance made his screen debut in the movie Panic in the Streets (1950), directed by Elia Kazan, who had directed Streetcar on Broadway. He played a gangster and was credited as "Walter (Jack) Palance". The same year he was featured in Halls of Montezuma (1951) about the United States Marines in World War II. He returned to Broadway for Darkness at Noon (1951), by Sidney Kingsley, which was a minor hit. Palance was second billed in just his third film, playing opposite Joan Crawford in the thriller Sudden Fear (1952). His character is written in as having been a coal miner, just as Palance's father had been. Palance received an Oscar nomination for Best Supporting Actor. He was nominated in the same category the following year as well, for his role as the hired gunfighter Jack Wilson in Shane (1953). This film was a huge hit and Palance was now established as a film name. Palance played a villain in Second Chance (1953) opposite Robert Mitchum and was an Indian in Arrowhead (1953). He got a chance to play a heroic role in Flight to Tangier (1953), a thriller. Palance played the lead in Man in the Attic (1953), an adaptation of The Lodger. He was Attila the Hun in Sign of the Pagan (1954) with Jeff Chandler, and Simon Magus in the Ancient World epic The Silver Chalice (1954) with Paul Newman. He had the star part in I Died a Thousand Times (1955), a remake of High Sierra and was cast by Robert Aldrich in two star parts: The Big Knife (1955) from the play by Clifford Odets, as a Hollywood star; and Attack (1956), as a tough soldier in World War Two. He was in a Western, The Lonely Man (1957), playing the father of Anthony Perkins, and played a double role in House of Numbers (1957). In 1957, Palance won an Emmy Award for best actor for his portrayal of Mountain McClintock in the Playhouse 90 production of Rod Serling's Requiem for a Heavyweight. Warwick Films hired him to play the hero in The Man Inside (1958), shot in Europe. He was reunited with Aldrich and Chandler on Ten Seconds to Hell (1959) playing a bomb disposal expert, filmed in Germany. He made Beyond All Limits (1959) in Mexico, and Austerlitz (1960) in France, then did a series of films in Italy: Revak the Rebel (1961), Sword of the Conqueror (1961), The Mongols (1961), The Last Judgment (1961), Barabbas (1961), Night Train to Milan (1962), and Warriors Five (1962). Jean-Luc Godard persuaded Palance to take on the role of Hollywood producer Jeremy Prokosch in the nouvelle vague movie Le Mépris (1963) with Brigitte Bardot. Although the main dialogue was in French, Palance spoke mostly English. Palance returned to the US to star in the TV series The Greatest Show on Earth (1963–64). He played a gangster in Once a Thief (1965) with Alain Delon. Later, in 1966, he appeared in the television movie Alice Through the Looking Glass, directed by Alan Handley, in which he played the Jabberwock. He had a featured role opposite Lee Marvin and Burt Lancaster in the Western adventure The Professionals (1966). He guest starred on The Man from UNCLE and the episodes were released as a film, The Spy in the Green Hat (1967). Palance went to England to do Torture Garden (1967) and did Kill a Dragon (1968) in Hong Kong. Palance provided narration for the 1967 documentary, And Still Champion! The Story of Archie Moore. In 1969, Palance recorded a country music album in Nashville, released on Warner Bros. Records. It featured Palance's self-penned song "The Meanest Guy That Ever Lived". The album was re-released on CD in 2003 by the Water label (Water 119). His films tended to be international co productions by now: They Came to Rob Las Vegas (1968), The Mercenary (1968), The Desperados (1969), and Marquis de Sade: Justine (1969). Palance had an excellent part in the Hollywood blockbuster Che! (1969) playing Fidel Castro opposite Omar Sharif in the title role but the film flopped. Palance went back to action films and Westerns: Battle of the Commandos (1970), The McMasters (1970) and Compañeros (1970). He had another good role in Monte Walsh (1970), from the author of Shane, opposite Lee Marvin, but the film was a box office disappointment. So too was The Horsemen (1971) with Sharif, directed by John Frankenheimer. Palance supported Bud Spencer in It Can Be Done Amigo (1972) and Charles Bronson in Chato's Land (1972) and had the lead in Sting of the West (1972), and Brothers Blue (1973). In Britain he appeared in a highly acclaimed TV movie Bram Stoker's Dracula (1973) playing the title role, directed by Dan Curtis. Three years before, comic book artist Gene Colan based his interpretation of Dracula for the acclaimed series The Tomb of Dracula on Palance, explaining, "He had that cadaverous look, a serpentine look on his face. I knew that Jack Palance would do the perfect Dracula." He went back to Hollywood for Oklahoma Crude (1973) then to England to star in Craze (1975). Palance starred in the television series Bronk between 1975 and 1976 for MGM Television. Following it he starred in the TV movie The Hatfields and the McCoys (1975) and The Four Deuces (1976). In the late 1970s Palance was mostly based in Italy. He supported Ursula Andress in Africa Express (1976) and L'Infermiera (1976), Lee Van Cleef in God's Gun (1976), and Thomas Milian in The Cop in Blue Jeans (1976). Palance was in Black Cobra Woman (1976); Safari Express (1976), a sequel to Africa Express; Mister Scarface (1976); and Blood and Bullets (1976). He travelled to Canada to make Welcome to Blood City (1977) and the US for The One Man Jury (1978), Portrait of a Hitman (1979) and Angels Revenge (1979). Palance went back to Canada for H. G. Wells' The Shape of Things to Come (1979). In 1980, Jack Palance narrated the documentary The Strongest Man in the World by Canadian filmmaker Halya Kuchmij, about Mike Swistun, a circus strongman who had been a student of Houdini's. Palance attended the premiere of the film on June 6, 1980 at the Winnipeg Art Gallery. He appeared in The Ivory Ape (1980), Without Warning (1980), Hawk the Slayer (1980), and the slasher film Alone in the Dark (1982). In 1982, Palance began hosting a television revival of Ripley's Believe It or Not!. The weekly series ran from 1982 to 1986 on the American ABC network. The series also starred three different co-hosts from season to season, including Palance's daughter Holly Palance, actress Catherine Shirriff and singer Marie Osmond. Ripley's Believe It or Not! was in rerun syndication on the Sci-fi Channel (UK) and Sci-fi Channel (US) during the 1990s. He appeared in the films Gor (1987) and Bagdad Café (1987). Palance had never been out of work since his career began. But his success on Ripley's Believe It or Not! and the international box-office hit of Bagdad Cafe (1987) resulted in a demand for his services in big budget Hollywood films. He made memorable appearances as villains in Young Guns (1988) as Lawrence Murphy, Tango & Cash (1989) and Tim Burton's Batman (1989). He also performed on Roger Waters' first solo album release The Pros and Cons of Hitch Hiking (1984) and was in Outlaw of Gor (1988) and Solar Crisis (1990). Four decades after his film debut, Palance won an Academy Award for Best Supporting Actor on March 30, 1992 for his performance as cowboy Curly Washburn in the comedy City Slickers (1991). Stepping onstage to accept the award, the 6' 4" (1.93 m) actor looked down at 5' 7" (1.70 m) Oscar host Billy Crystal (who was also his co-star in the movie), and joked, mimicking one of his lines from the film, "Billy Crystal... I crap bigger than him." He then dropped to the floor and demonstrated his ability, at age 73, to perform one-handed push-ups. The audience loved the moment as host Crystal turned it into a running gag. At various points in the broadcast, Crystal announced that Palance was "backstage on the Stairmaster"; had bungee-jumped off the Hollywood sign; had rendezvoused with the space shuttle in orbit; fathered all the children in a production number; been named People magazine's "Sexiest Man Alive"; and won the New York primary election. At the end of the broadcast, Crystal said he wished he could be back next year but "I've just been informed Jack Palance will be hosting." Years later, Crystal appeared on Inside the Actors Studio and fondly recalled that, after the Oscar ceremony, Palance approached him during the reception: "He stopped me and put his arms out and went, 'Billy Crystal, who thought it would be you?' It was his really funny way of saying thank you to a little New York Jewy guy who got him the Oscars." In 1993, during the opening of the Oscars, a spoof of that Oscar highlight featured Palance appearing to drag in an enormous Academy Award statuette with Crystal again hosting, riding on the rear end of it. Halfway across the stage, Palance dropped to the ground as if exhausted, but then performed several one-armed push-ups before regaining his feet and dragging the giant Oscar the rest of the way across the stage. He appeared in Cyborg 2 (1993); Cops & Robbersons (1994) with Chevy Chase; City Slickers II: The Legend of Curly's Gold (1994), and on TV in Buffalo Girls (1995). He also voiced Rothbart in the 1994 animated film The Swan Princess. Palance's final films included Ebenezer (1998), a TV Western version of Charles Dickens' classic "A Christmas Carol" with Palance as Scrooge, Treasure Island (1999), Sarah, Plain and Tall: Winter's End (2000) and Prancer Returns (2001). Palance, at the time chairman of the Hollywood Trident Foundation, walked out of a Russian Film Festival in Hollywood in 2004. After being introduced, Palance said, "I feel like I walked into the wrong room by mistake. I think that Russian film is interesting, but I have nothing to do with Russia or Russian film. My parents were born in Ukraine: I'm Ukrainian. I'm not Russian. So, excuse me, but I don't belong here. It's best if we leave." Palance was awarded the title of "People's Artist" by Vladimir Putin, president of Russia; however, Palance refused the title. In 2001, Palance returned to the recording studio as a special guest on friend Laurie Z's album Heart of the Holidays to narrate the classic poem "The Night Before Christmas". In 2002, he starred in the television movie Living with the Dead opposite Ted Danson, Mary Steenburgen and Diane Ladd. In 2004, he starred in another television production, Back When We Were Grownups, opposite Blythe Danner. This was his final performance. Palance lived for several years around Tehachapi, California. Palance was married to his first wife Virginia Baker from 1949 to 1968. They had three children: Holly (born 1950), Brooke (born 1952), and Cody (1955–1998). On New Year's Day 2003, Baker was struck and killed by a car in Los Angeles. Palance's daughter Brooke married Michael Wilding, son of Michael Wilding Sr. (1912–1979) and Elizabeth Taylor; they have three children. Cody Palance, an actor himself, appeared alongside his father in the film Young Guns. In May 1987, Palance married his second wife Elaine Rogers. Palance painted and sold landscape art, with a poem included on the back of each picture. He was also the author of The Forest of Love, a book of poems published in 1996 by Summerhouse Press. He was a supporter of the Republican Party. Palance acknowledged a lifelong attachment to his Pennsylvania heritage and visited there when able. Shortly before his death, he sold his farm in Butler Township and put his personal art collection up for auction. The novelist Chuck Palahniuk, author of Fight Club and other works, has acknowledged in a 2007 interview that he is a distant nephew of Jack Palance. On November 10, 2006, Palance died of natural causes at age 87 at his daughter Holly's home in Montecito, California. Palance has a star on the Hollywood Walk of Fame at 6608 Hollywood Boulevard. In 1992, he was inducted into the Western Performers Hall of Fame at the National Cowboy & Western Heritage Museum in Oklahoma City, Oklahoma. According to writer Mark Evanier, comic book creator Jack Kirby modeled his character Darkseid on the actor. The Lucky Luke 1956 comic Lucky Luke contre Phil Defer by Morris features a villain named Phil Defer who is a caricature of Jack Palance. 1950 Lights Out Episode: "The Man Who Couldn't Remember"
1952 Westinghouse Studio One Episode: "The King in Yellow"
Westinghouse Studio One Episode: "Little Man, Big World"
The Gulf Playhouse Episode: "Necktie Party"
1953 Danger Episode: "Said the Spider to the Fly"
The Web Episode: "The Last Chance"
Suspense Tom Walker Episode: "The Kiss-Off"
The Motorola Television Hour Scott Malone/Kurt Bauman Episode: "Brandenburg Gate"
Suspense Episode: "Cagliostro and the Chess Player"
1956 Playhouse 90 Harlan "Mountain" McClintock "Requiem for a Heavyweight"
Zane Grey Theatre Dan Morgan Episode: "The Lariat"
1957 Playhouse 90 Monroe Stahr "The Last Tycoon"
Playhouse 90 Manolete "The Death of Manolete"
1965 Convoy Harvey Bell Episode: "The Many Colors of Courage"
1966 Run for Your Life Julian Hays Episode: "I Am the Late Diana Hays"
The Man from U.N.C.L.E. Louis Strago 2 episodes "The Concrete Overcoat Affair: Parts I and II"
1971 Net Playhouse President Jackson "Trail of Tears"
1979 Buck Rogers in the 25th Century Kaleel Episode: "Planet of the Slave Girls"
1981 Tales of the Haunted Stokes Episode: "Evil Stalks This House"
2001 Night Visions Jake Jennings Segment: "Bitter Harvest"
^ "Veteran western star Palance dies". 2006-11-11. Retrieved 2019-02-25. ^ "Jack Palance Biography (1920?-)". Filmreference.com. Retrieved 2016-09-25. ^ "The Last Role of an American "City Slicker" with a Ukrainian Soul". Ukemonde.com. 2006-11-14. Retrieved 2016-09-25. ^ "Entertainment | Veteran western star Palance dies". BBC News. 2006-11-11. Retrieved 2016-09-25. ^ A History of the Polish Americans. Books.google.com. p. 113. Retrieved 2016-09-25. ^ Boxing Records Official records only show Palance in one sanctioned fight. His other fights may have been club fights. ^ Enk, Bryan. "Real Life Tough Guys". Yahoo.com. Archived from the original on 30 July 2013. Retrieved 27 July 2013. ^ "Accomplished Alumni - School of Humanities and Sciences". Humsci.stanford.edu. Archived from the original on 2016-09-11. Retrieved 2016-09-25. ^ "YouTube". YouTube. Retrieved 2016-09-25. ^ PALANCE FROM 'PANIC' TO 'PAGAN' By M. A. SCHMIDT HOLLYWOOD.. New York Times (1923-Current file) [New York, N.Y] 14 Mar 1954: X5. ^ Field, Tom (2005). Secrets in the Shadows: The Art & Life of Gene Colan. Raleigh, North Carolina: TwoMorrows Publishing. p. 99. ^ "Strongest Man In The World on Vimeo". Vimeo.com. 2015-10-07. Retrieved 2016-09-25. ^ Grimes, William (30 March 1993). "Eastwood Western Takes Top 2 Prizes In 65th Oscar Show". New York Times. The New York Times Company. Retrieved 9 May 2017. ^ "Declaring 'I'm Ukrainian, not Russian', Palance walks out of Russian Film Festival in Hollywood". Ukemonde.com. 2004-06-11. Retrieved 2016-09-25. ^ The Forest of Love. Summerhouse Press. 1996-01-01. Retrieved 2012-08-15. ^ "The Republicans of Classic Hollywood". fan.tcm.com. Retrieved January 7, 2013. ^ Learn-Andes, Jennifer. "Jump on Jack's stash". TimesLeader.com. Archived from the original on 2006-10-19. Retrieved 2006-10-08. ^ "Chuck Palahniuk Answers Your Questions". The A.V. Club. 2007. 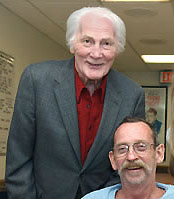 ^ "Oscar winner Jack Palance dead at 87". CNN.com. 2006-11-11. Retrieved 2016-09-25. ^ "Jack Palance". All Music. Retrieved 5 January 2015. This page is based on the Wikipedia article Jack Palance; it is used under the Creative Commons Attribution-ShareAlike 3.0 Unported License (CC-BY-SA). You may redistribute it, verbatim or modified, providing that you comply with the terms of the CC-BY-SA.